Well I solved one problem, the intermittent timing light. Turns out the switched power I used for the ignition coil was only 10.5V, so I changed it to a more reliable 11.7 volts source and now the timing light is constant. 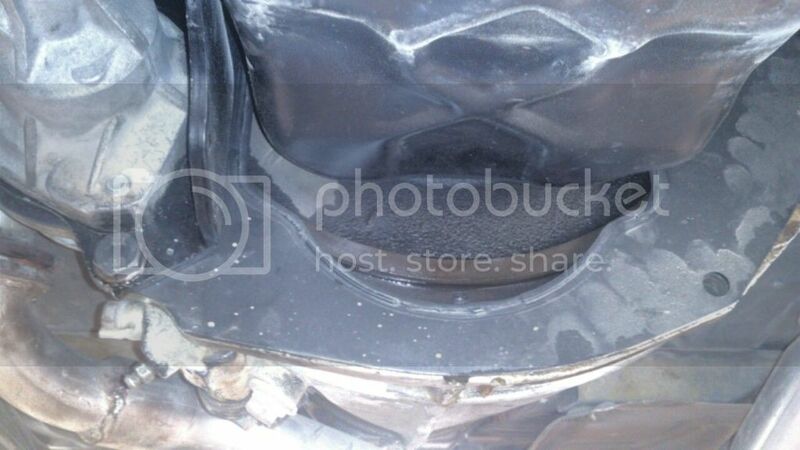 This is a massive gap between the bell housing and the VG30 engine. This will be a huge source for dust to enter the bell housing and contaminate everything in there. Is there a dust cover for it? Or else how is this supposed to be closed off? I can't imagine this was like that from the factory. Guys, any help with this question? Most all Datsun trans seem to have this sort of thing. Generally there is either a cover piece that bolts over it, or a full, fitted sheet that is sandwiched between the block and the transmission case. Below shows the cover plate setup. This is for an L16 engine. The L20B came with a full, sandwiched sheet. I'm not familiar with the VG series to know which setup it would have. Looks like you have some fab in your future! okayfine wrote: Most all Datsun trans seem to have this sort of thing. Generally there is either a cover piece that bolts over it, or a full, fitted sheet that is sandwiched between the block and the transmission case. Interesting. Thanks for the hint. I guess I will try to search for that piece. Otherwise I'll just fabricate a small piece of sheet metal and bolt it up there. two_68_510s wrote: Looks like you have some fab in your future! Interesting. There's a plate cover that I'm missing. Well there's good news and there's bad news. The good news: the new harness works well and all my electronics are back to normal. The bad news: I don't know what happened to my engine. It stopped for almost a week until I got the new harness installed, but when I ran it yesterday, it was running very rough with very poor throttle response. I have no idea why it's doing that, last time I ran it it seemed perfect, very smooth. The engine seems to be running extremely rich, I can smell unburnt fuel from the exhaust. I checked the ignition timing, not changed, I checked all spark plug wires, all are giving good signal. I haven't checked my spark plugs, by my guess is I'll find a few that are wet. It feels like a carburetor problem, but I haven't touched that since my last time at all, everything is exactly the way it was. I need advice on where to look. 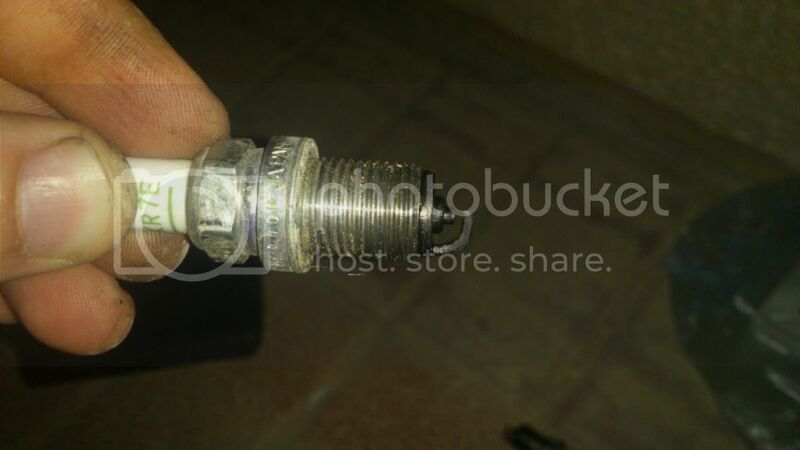 I'll go and buy some new spark plugs, but I got a feeling it is not a spark plug problem. I'll replace them because so far I've been running old ones. Plug condition may tell you something. Pull 'em and post a picture. Note if they're all the same condition, or if one or more are different. okayfine wrote: Plug condition may tell you something. Pull 'em and post a picture. Note if they're all the same condition, or if one or more are different. Yeah, that's what I just did. Too bad, seems I must have made a serious mistake in my engine rebuild. Two of the plugs, #3 and #5, were completely wet with engine oil. One, #4, was dry but completely fouled. The other three were good. I'm going to do compression testing to see where the problem is. But most likely I am not going to rebuild it again. I'll just get a JDM engine and bolt it on. I'm disappointed with myself. Compression and then a leak-down test will likely isolate the cause (rings, valve seals, HG). Something to learn, and potentially not an engine killer. What's a leak down test? I am very frustrated because I really didn't want to tear my engine apart again! And the most difficult part is removing and dropping it back in. But thanks for your help, I appreciate it. Compression tester just tests compression. Leak-down pressurizes the cylinder and measures the amount escaping. From there you can hear if it's coming out of the exhaust, through the valve cover, etc.